So...crying is what's on the agenda for today then, huh? Right on. In all seriousness, this touching Twitter thread will take you on a feels trip. It's as if the story gets a little more emotional, every time we read it. As bad as things get, which they do very often, we're still impressed by incredible coincidences that just seem to happen all the time. It's not every day that you meet someone who played such an important role in your past. This is the stuff that hearts were warmed from. If you're in the market for some more wholesome stuff, here's a guy realizing his neighbor Gene is cooler than he expected. This army veteran's story about his personal experience with guns got Twitter GOING. A black and white American flag t-shirt spotted at a Pacific Sunwear in Alabama this weekend has a lot of people seeing red. Rachel Zawacki-Kuss uploaded the above photo to Facebook on Saturday, with a message saying that she would never be shopping at the store again. It sells for $23.95 online and is actually part of a line of clothing in collaboration with the A$AP Mob, a hip hop collective from New York. 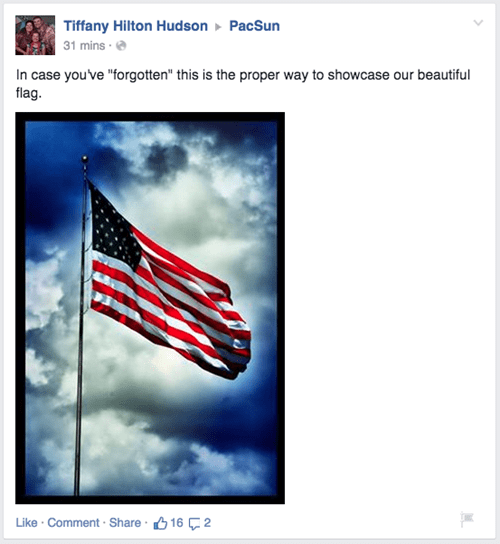 But her post still struck a chord with lots of people online considering that it was Memorial Day weekend, a holiday intended to pay tribute to fallen men and women in the armed forces. 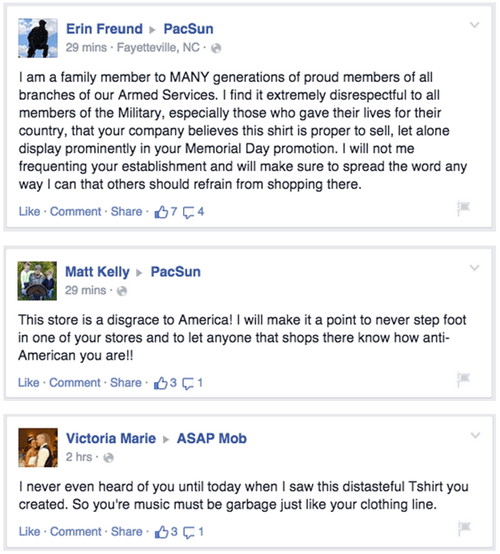 Angry Americans are expressing their outrage by posting messages on both the PacSun Facebook page and the A$AP Mob page criticizing the group and demanding that the shirt be removed from stores. It has since been removed from that specific store in light of the complaints, according to the NY Daily News. Just a few weeks ago, Under Armour was involved in a similar controversy, in which the clothing company was forced to apologize for selling an Iwo Jima basketball t-shirt. PacSun’s Twitter account has been promoting some other American Flag themed designs for Memorial Day as well, including various shirts, shoes, bathing suits and tank tops. So if you aren’t a fan of the flag shirt, they offer plenty of other options to show off your patriotism like these two.